Great placemaking is the art of bringing together a number of elements, both physical and operational. It requires the careful orchestration of the specialized talents and skills of many people, and of many economic and design elements, all of which must work together to create a successful place. Following is a highlight of the most important elements of successful places. The heart of successful TODs is close proximity to rail stations, plus the quality of the walking experience to enable and encourage high levels of walking and biking to and from the station. 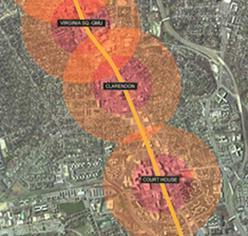 Projects should be no more than a 1/4 to 1/2 mile from a rail station (currently in operation, or under construction). Rail includes high speed rail, commuter rail, metro, light rail, and streetcar. This close proximity enables people to get to the station within a comfortable 5-10 minute walk. Ideally, the walk needs to be a high quality, pedestrian-friendly experience. Walking across large parkinglots, or along a busy 6-lane road with little or no protection from traffic is not an acceptable walking experience, and will discourage walking, even if its within the 1/4 to 1/2 mile distance. The walking route needs to be safe, comfortable, and pleasant to encourage widespread walking and bicycling to and from the station. The combination of buildings and public spaces define a place. Great public spaces are the living rooms of the city - the places where people come together to enjoy the city and each other. Public spaces make high quality life in the city possible - they form the stage and backdrop to the drama of life. Public spaces range from grand central plazas and squares, to small, local neighborhood parks. Successful public spaces have a sense of enclosure by attractive, human-scaled buildings that wrap a space like walls wrap a room. Active uses line the perimeter activating the space. Together these work as gathering spaces that bring people together. The combination of beautiful architecture with great public space creates exceptional places to live - places that express a life of richness and tradition. A careful mix of uses in close proximity creates synergy and diversity, creates activity day and night, and forms the building blocks for complete communities. Appropriate mix of uses include commerical, retail, offices, shops, hotels, residential, institutional, and civic. Idealy, the uses are mixed within each neighborhood, block, and building, and are physically and functionally integrated with direct pedestrian connections. A diversity of space and unit size/price offers a wide range of options to an entire community. Traditionally, human settlements have always been developed in mixed-use patterns because it made the most sense. Single-use zoning of entire communities is a bizarre anomaly without precedent in the 5,000 years of city building. Buildings and spaces sized to make humans feel comfortable and safe is the starting point for pedestrian scale walkable places. A compact, fine-grained network of sidewalks along blocks having a variety of uses in close proximity provides a comfortable balance for people to meet daily needs within a short walk. Uses include grocery stores, cafes, deli's, bakeries, newsstands, coffeehouses, personal services, vegetable stands, open-air markets, and public parks and plazas. Project should have a minimum Walk Score of 70. This variety of shops and services adds interest and activity day and night. Buildings with active store fronts, lots of windows, and apartments above with balconies add interest and life to a place. Many of the best pedestrian spaces in the world are car-free, adding an extra level of peace, comfort, safety, and beauty. Active ground-floor retail is essential for any successful TOD. The continuous line of shops is what activates the sidewalk and gives life to a block. When done right, ground-floor retail can go on for many blocks, and is most successful when continuous without any breaks, blank walls, or non-retail 'dead' frontages. The most successful places have a variety of store sizes with many small shops and narrow store fronts in each block. Larger stores are incorporated by tucking partly behind a line of smaller storefronts, and/or by going up to the second floor. Smaller spaces add more variety to each block and attract the unique, mom & pop type businesses - so important to giving places a unique character. Sidewalk cafes add a whole new level of vibrance to any TOD. Successful cafe districts bring together a number of cafes creating a large area for outdoor dining, either along the sidewalk, and/or in a plaza. Establishing cafe districts can be a great way to add a unique vitality to any street, make a district more inviting, encourage walking, and promote local economic development and tourism. Cafe districts create a special ambiance that attracts people. Outdoor cafes offer front-row seats to some of the best people watching in a city, and encourage people to spend more time socializing and enjoying, and return more often. 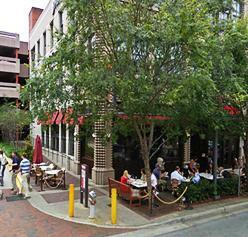 The more cafes there are and the larger the total outdoor seating area, the more people the district attracts. Some of the most successful cafe districts have more than 8 blocks of continuous sidewalk cafes totaling hundreds of seats! Trees add beauty, grandeur, and a humanizing feeling to streets, spaces and places. The power of trees to add life to a place by providing pedestrian comfort and urban livability is beyond measure. Trees add a unique living, moving element of beauty that complements the architecture while lifting people's spirits. The beneficial psychological healing effects of trees have been well documented. Trees also provide a host of valuable functions including producing oxygen, providing shade, cooling the air, filtering out toxic pollutants, providing UV protection, moderating winds, and absorbing large quantities of rain. This water absorption service greatly reduces the need for expensive storm water retention. Trees increase property values and retail sales, and slow cars & improve the sense of enclosure of street space with their canopies. Trees provide a pleasant place to walk or relax in cafes and public spaces. Trees also provide a host of climate solutions including absorbing large quantities of carbon, and shading buildings - reducing overall energy consumption used for air-conditioning. "According to the U.S. Department of Agriculture, the cooling impact of a single healthy tree is equivalent to 10 room-size air conditioners operating 24 hours a day." Parking and how well its incorporated into TODs goes a long way to helping create livable places, and transitioning places to become more walkable. Clustering parking in strategic locations can encourage walking and focus pedestrian activity along important commercial streets. Successful TODs utilize reduced total parking numbers, and incorporate central shared parking between different uses, thereby reducing overall parking numbers further compared to conventional development. Hiding the parking behind buildings, or wrapping parking structures with active uses helps create safe, appealing, walkable places. Large expanses of surface parking lots, or large exposed multi-story parking structures dehumanize places making them 'feel' unsafe, thereby discouraging walking.